In the summer I go on and on about delicious stone fruit and berries and light soups and refreshing summer salads. But now the days are dreary and grey. "Depressing" doesn't quite begin to describe how gloomy & galumphin' it's been looking for a couple of days. Also, the temps have dropped below 60, which means that I must now begin to prepare for winter hibernation (after spending more than half my lifetime in cold Atlantic climes, I am still a tropical child at heart - and at core body temp). I'm bringing out the tights, I'm scrounging around for scarves. I may not step outside today. Just a few days ago, though, I was all set to embrace global warming and the 80 degree October days I thought we were in for. Although the berries I saw were no longer the luscious berries of peak summer, it was time for one of my favorite fruits to make an appearance. Well, I guess the globe hasn't warmed all the way through just yet (yes, I suppose in the grand scheme of things that is a good thing - in the grand scheme of shorts and dresses, however, it is very very bad). 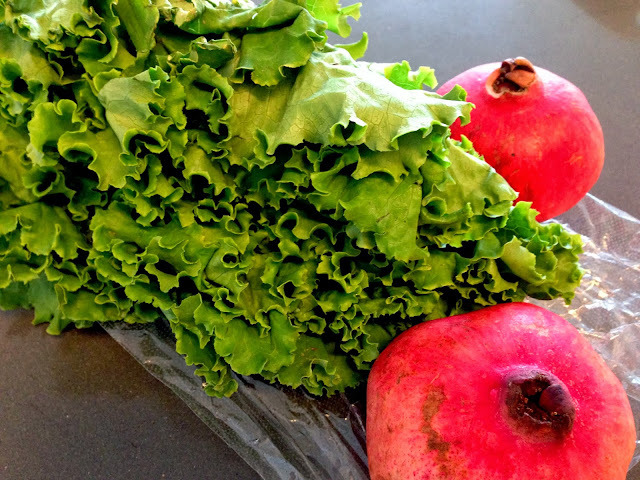 But even on a dreary day like today, a nice light pomegranate salad might just brighten things up for a moment. Besides, it's always fun to look like you just committed bloody murder with your bare hands, isn't it? "Oh," you say, "why don't you just use one of those tricks like whacking the pomegranate with a wooden spoon for a bit before you remove the arils?" 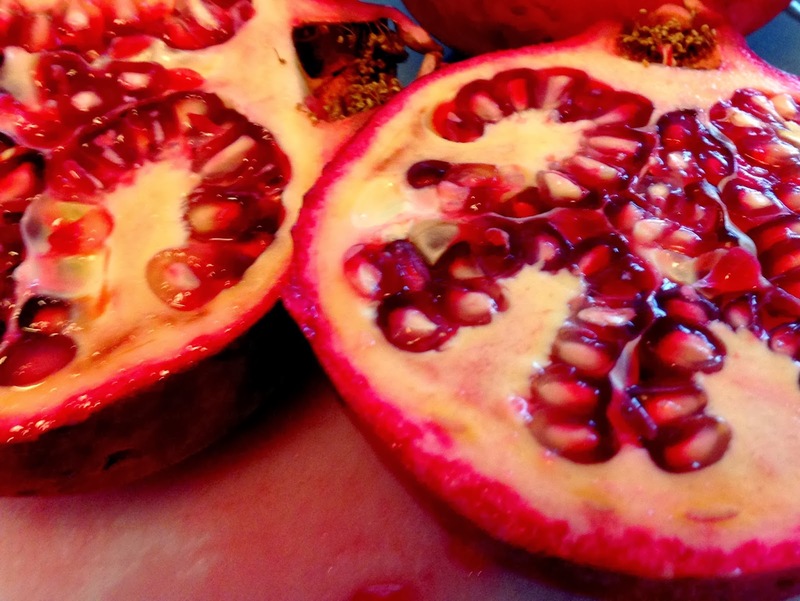 Well, believe you me, I spent a good few minutes looking absolutely absurd whacking that pomegranate for all it was worth, and I still couldn't quite achieve the mess-less aril removal the procedure promises. I even tried removing the arils in a bowl full of water with less than spectacular results (let's not get into that). In any event, remove the arils in whatever way works for you. Me, I quite enjoy giving myself over to the messy endeavor and just make sure to put on an apron if I'm wearing something I care about deeply (who am I kidding - this is the time to break out that ratty ol' shirt that already has turmeric spots on it). Combine these bright little bursts of flavor and juice with a soft butter lettuce, crisp cress, and spicy arugula, and now you've got yourself a salad to be happy about. And if you happen to come across a prickly pear and not really know what to do with it, juice it up and use it in the dressing! 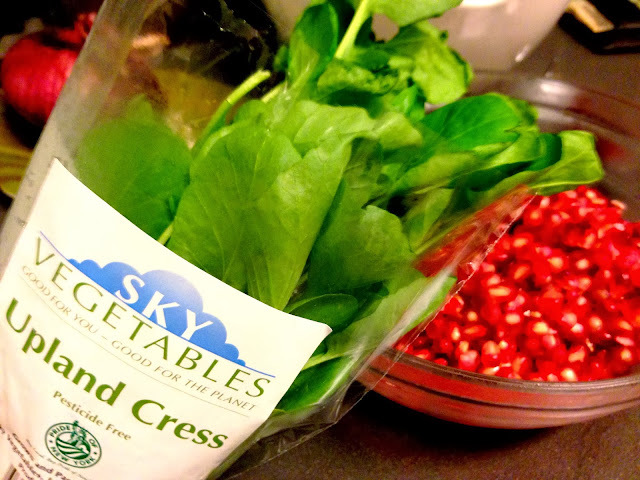 Rinse and spin dry the lettuce, arugula, and cress. 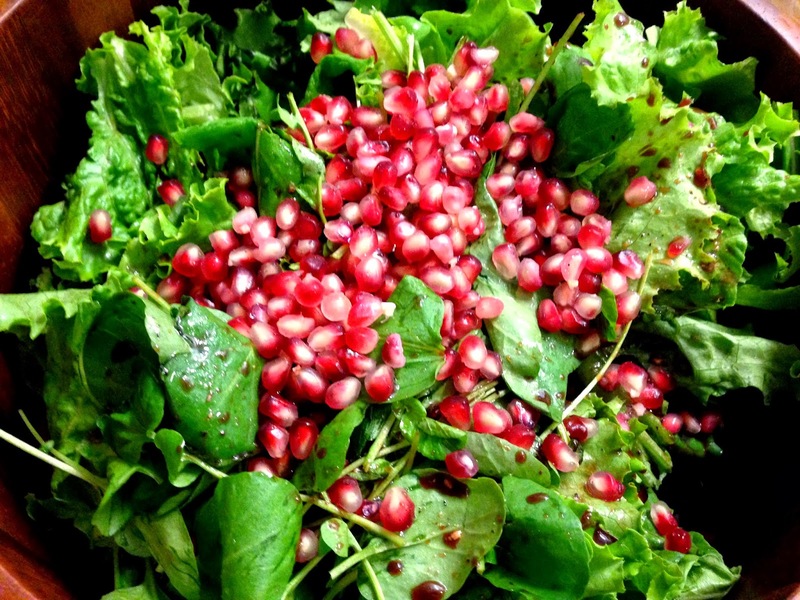 Tear into evenly sized pieces and place in salad bowl with the pomegranate arils. In a bowl, combine all the ingredients of the dressing and whisk together. Pour over the salad, toss, and serve!